David Harvey, The Law Emprynted and Englysshed: The Printing Press as an Agent of Change In Law and Legal Culture 1475-1642. Oxford, United Kingdom: Hart Publishing, 2015. Abolitionist Wendell Phillips once wrote that “[w]hat gunpowder did for war, the printing press has done for the mind.” While it is undisputed that Johannes Gutenberg’s mid-fifteenth-century invention of the movable type printing press revolutionized the production and dissemination of the written word, a new book on the impact of this innovation on early sixteenth- and seventeenth-century legal culture in England describes a much more measured and gradual assimilation of this new technology. David Harvey’s The Law Emprynted and Englysshed : The Printing Press as an Agent of Change In Law and Legal Culture 1475-1642 identifies a number of cultural and structural impediments that limited the impact of the printing press on legal literature and practice in the fifteenth and sixteenth centuries. 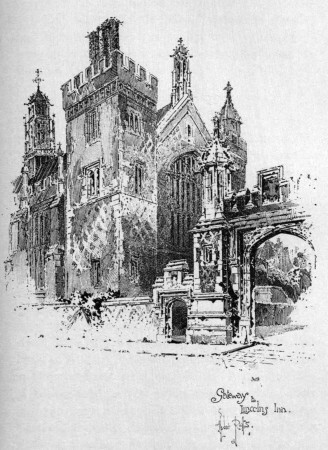 A nineteenth-century depiction of the gateway to Lincoln’s Inn, the largest of the London Inns of Court and perhaps the oldest. As a starting point for his examination, Harvey applies Elizabeth Eisenstein’s theories on the impact of the printing press as an agent of change among literate elites developed from her works The Printing Press as an Agent of Change and The Printing Revolution in Early Modern Europe. In those books, Eisenstein identifies six features of print that differ radically from scribal texts. They are: a) dissemination, b) standardization, c) reorganization, d) data collection, e) fixity and preservation, and f) amplification and reinforcement. Applying each feature, the printing press allowed rare manuscript works to be distributed widely, in identical print runs. Errors in the text could be easily corrected with the insertion of “errata” notes or by the production of later corrected editions. The press also provided greater flexibility in reorganizing text and allowed authors the ability to create tables and indices to improve access to the intellectual content of the work. It provided fixity and preservation, as knowledge transmitted through oral traditions could now be codified in a standard form in print, and the large number of volumes produced in a given print run improved the chances of the work being preserved for the use of later scholars. Finally, printed texts enhanced the amplification and reinforcement of the ideas memorialized within the pages of a book as passages drawn from scribal sources were reproduced and repeated in later works in quantities much greater than relatively rare manuscript versions. Harvey argues that Eisenstein’s theories insufficiently describe the true influence of the printing press on legal culture in the fifteenth and sixteenth centuries. He suggests that a complex set of factors came into play that largely determined how print materials were used by lawyers in this period. Harvey posits that one must also look at how the printing was regulated by the Crown, how lawyers were trained, and, finally, how they contributed to and consumed the literature of the law to truly understand the influence of the printing press on the nascent legal community of the period. For example, lawyers of the period were trained in the Inns of Court and Chancery. Students of law were instructed in an aural and oral tradition that included formal lectures or “readings” of a text supplemented by discussions, questions, and debate among lecturers and students. The readings elucidated statutory sources and illustrated points of law with case examples. Lectures were then accompanied by exercises in the form of case arguments or moots where students could apply the law in a hypothetical situation. Harvey posits that one must also look at how the printing was regulated by the Crown, how lawyers were trained, and, finally, how they contributed to and consumed the literature of the law to truly understand the influence of the printing press on the nascent legal community of the period. 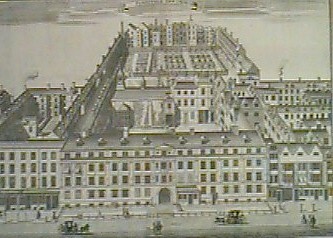 Furnival’s Inn, an Inn of Chancery founded in the fourteenth century and attached to Lincoln’s Inn, was dissolved in the early nineteenth century. Manuscript sources stubbornly persisted in the Inns well beyond the introduction of the printing press. Students took case notes (“reports”) and these materials were compiled into case books or “commonplace” books for their personal use. William Fullbecke, in his book A Direction or Preparative to the Study of the Law, published in 1600, suggested that reading and compiling case notes manually was a superior method of learning the law as opposed to relying upon the abridgments in print available at the time. Many Inns also boasted libraries of manuscripts available to students for transcription. The Year Books, which contained the pleadings of lawyers and judges on a particular case in Common Pleas were also used in manuscript format well into the middle of the sixteenth century when most of these eventually found their way into print. As these collections did not contain indices or title pages, it was not until the emergence of yearbook abridgments by Statham, Fitzherbert, and Brooke, as well as the groundbreaking reports of Plowden and Coke that the early common law was organized in a more accessible form for the student and practicing attorney. Legal publishing in the period 1475 to 1642 was slow to develop as an industry. In the sixteenth century, both paper and type had to be imported from the continent; therefore, producing a text required a considerable initial monetary outlay. That made for a somewhat risky investment given the relatively small market for law books in this period. The highly regulated nature of the industry also contributed to limiting the number of entrants to the field. Initially, the Crown nurtured printing in its infancy, allowing foreign printers to operate by exempting them from residency or citizenship requirements. These were later re-imposed to stimulate the growth of an indigenous printing industry in England. The Crown also established monopolies for various forms of legal printing. For example, in 1485, Henry VII appointed Peter Actors as the first King’s Stationer (later Royal Printer). This granted his firm the exclusive right to print English statutes and royal decrees. Initially this position was an appointment for life, until Edward VI appointed his own King’s Printer upon his accession to the throne. The Royal Printer ensured that authoritative texts of proclamations and statutes could be disseminated to all corners of the Realm. This in turn furthered public understanding of the law and facilitated more careful study of statutes by students and practitioners of the law. Additionally, the Crown issued patents to certain printers granting them the sole right to print certain types of legal works. These patents could be given as patronage for past service or as a reward. One notable holder of the patent was Richard Tottel. Tottel held the patent for nearly fifty years, producing 225 known editions of the venerable Year Books, which, as noted above, served as the staple literature for law students and practitioners of this period. Tottel ceased printing in 1591, and died two years later. After his death, the reversion of the patent fell into dispute for many years as later publishers battled over ownership and the scope of the patent. …the Crown issued patents to certain printers granting them the sole right to print certain types of legal works… One notable holder of the patent was Richard Tottel. This continued until 1605 when the Stationers Company (formerly Stationers Guild) took over the patent. From this point forward, the Stationers nominated printers to produce common law books. The author contends that the issuance of the common law patent was not an entirely bad thing: it did not completely restrain the growth of the fledgling legal publishing industry, but rather served to establish authoritative, standardized editions of certain works produced by reputable, known publishers. Also looming large over the printing industry in this era was the Stationers Guild (later Stationers Company) mentioned above. It was granted a Charter of Incorporation from the Crown in 1557 which vested within the Company important powers to regulate the print trade and concentrate printing activity within the exclusive purview of its members. It utilized a licensing system that assigned the rights to print certain works to Company members only. While it has been suggested that the Company worked hand in glove with the Crown for the purpose of censuring seditious and heretical content, the author argues that the powers of search granted by the Charter were used primarily for identifying and closing unlicensed printers, rather than censure. Indeed, its Charter granted it no such powers of censorship. That job was left to ecclesiastical boards of licensors who approved potentially heretical, seditious, or otherwise unsuitable books for publication. Despite the Company’s licensing system, various disputes over the scope of the common law patents and exclusive licenses granted by the Company produced a great deal of litigation which was heard before the Star Chamber, a conciliar Court of the Realm. As a result of one of these cases, the Chamber issued a series of decrees which was intended to correct the “disorders” in the trade resulting from the many legal disputes. Their 1637 decree created a comprehensive regulatory structure for the industry. It also imposed content controls by prohibiting unlicensed printing of pamphlets and books. 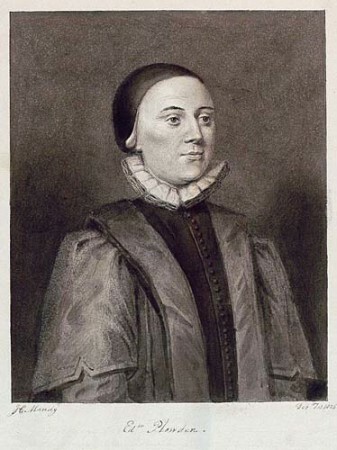 Edmund Plowden (1518-1585) produced the first nominative reporter (his Commentaries), notable for its focus on points of law rather than arguments. Despite the heavy regulation of the industry during the period of Harvey’s study, the legal printing trade blossomed in the seventeenth century and produced many of the classic works of the common law. While law printing in the sixteenth century was primarily concerned with printing the Year Books and putting to type classic treatises by Glanvill, Bracton, and Littleton, the last quarter of the century saw the production of important works such as Plowden’s Commentaries. This work was an entirely new form of law reporting that more closely resembled a modern reporter in style and substance. It was the first nominative reporter, and the first to include party names in case citations. It also pulled together in one place all the information relevant to the disposition of the case. These stylistic innovations proved popular with lawyers and students, and the Commentaries saw several reprintings and was later abridged. This period also saw the production of law texts on discrete subjects as well. For example, guidebooks such as Dalton’s The Countrey Justice helped to establish uniform practice among English justices of the peace throughout the land. Works designed to assist students in the study of law such as the Fulbecke work and Doderidge’s The English Lawyer illuminated the nature of legal practice. The seventeenth century also saw the printing of the venerable Coke’s Reports, and his Institutes of the Lawes of England, heralding a narrative form of law book – the legal treatise. Despite the heavy regulation of the industry during the period of Harvey’s study, the legal printing trade blossomed in the seventeenth century and produced many of the classic works of the common law.